Voltage-gated potassium (Kv) channels represent the most complex class of voltage-gated ion channels from both functional and structural standpoints. Their diverse functions include regulating neurotransmitter release, heart rate, insulin secretion, neuronal excitability, epithelial electrolyte transport, smooth muscle contraction, and cell volume. KCNH7 is a member of the potassium channel, voltage-gated, subfamily H. This member is a pore-forming (alpha) subunit. Voltage-gated potassium (Kv) channels represent the most complex class of voltage-gated ion channels from both functional and structural standpoints. Their diverse functions include regulating neurotransmitter release, heart rate, insulin secretion, neuronal excitability, epithelial electrolyte transport, smooth muscle contraction, and cell volume. This gene encodes a member of the potassium channel, voltage-gated, subfamily H. This member is a pore-forming (alpha) subunit. There are at least two alternatively spliced transcript variants derived from this gene and encoding distinct isoforms. Formalin-fixed and paraffin-embedded human brain tissue reacted with KCNH7 Antibody (N-term) Cat.-No AP52306PU-N, which was peroxidase-conjugated to the secondary antibody, followed by DAB staining. 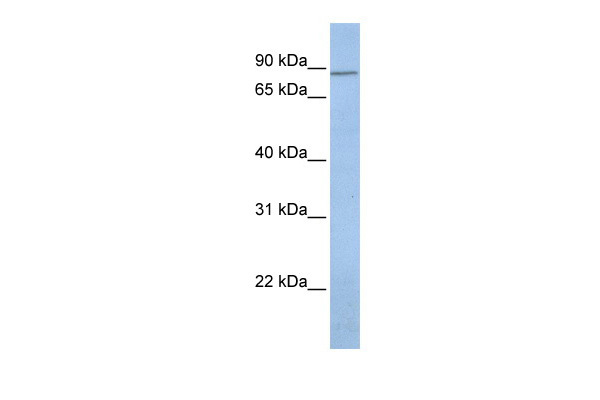 Western blot analysis of KCNH7 Antibody (N-term) Cat.-No AP52306PU-N in T47D cell line lysates (35ug/lane). KCNH7 (arrow) was detected using the purified Pab. 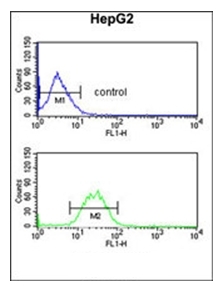 Flow cytometric analysis of HepG2 cells using KCNH7 Antibody (N-term) Cat.-No AP52306PU-N (bottom histogram) compared to a negative control cell (top histogram). FITC-conjugated goat-anti-rabbit secondary antibodies were used for the analysis. Western blot analysis of rat brain lysate: 1. Anti- Kv11.3 (erg3) antibody , (1:300). 2. 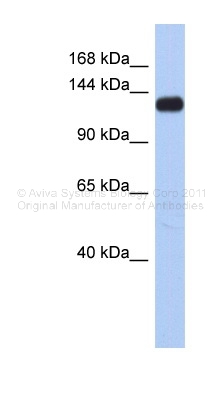 Anti- Kv11.3 (erg3) antibody, preincubated with the control peptide antigen. 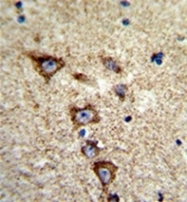 Expression of KV11.3 in rat cerebellum. 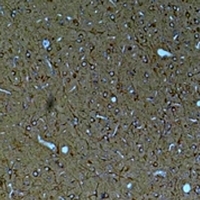 Immunohistochemical staining of rat cerebellum using Anti-Kv11.3 (erg3) antibody . A. Kv11.3 channel appears in glial processes (red). B. Staining of astrocytic fibers with mouse anti glial fibrillary acidic protein (GFAP, green). C. Confocal merge of Kv11.3 channel and GFAP demonstrates colocalization in the molecular layer but separate localization of these proteins at the Purkinje cell layer. Western blot analysis of Kv11.3 expression in HeLa (A); mouse brain (B); rat brain (C) whole cell lysates. Immunohistochemical analysis of Kv11.3 staining in rat brain;mouse brain formalin fixed paraffin embedded tissue section. The section was pre-treated using heat mediated antigen retrieval with sodium citrate buffer (pH 6.0). The section was then incubated with the antibody at room temperature and detected using an HRP conjugated compact polymer system. DAB was used as the chromogen. The section was then counterstained with haematoxylin and mounted with DPX.